Poorly animated, dismally scripted and badly conceived, this is a thoroughly depressing and ultimately laugh-free comedy that's too violent for kids and too boring for adults. 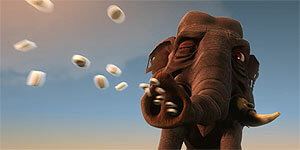 Simon Pegg rewrote the script for this Norwegian animated comedy about a drug-addicted elephant called Jimmy, who escapes from the circus and is pursued by various groups including some militant animal rights types (voiced by Kyle MacLachlan, Jim Broadbent and Samantha Morton, among others), four stoner criminal types (including Phil Daniels, Woody Harrelson and Simon Pegg), several members of the vicious Lapland Mafia (don't ask) and four pissed-up Scottish big game hunters (including James Cosmo, Douglas Henshall and David Tennant). It turns out, rather distastefully, that Jimmy has several pounds of heroin stitched inside him, which is slowly killing him. Meanwhile, all the characters eventually bump into each other on the moors, with violent and messy results. The tone of the film is set early on when the animal rights types free some mice and a cat, only for the mice to get eaten by a cat and the cat to get killed by a bulldog belonging to one of the activists. If that sort of thing, coupled with the idea of a heroin-addicted elephant is your idea of a good time, then Free Jimmy has your name written all over it. Frankly, with a rewritten script by Pegg, you'd expect there to be at least a few funny lines in it, even if the visual humour isn't up to much. Sadly, that's not the case – all the characters just witter on endlessly, either swearing or moaning, and it quickly becomes tiresome. The extremely depressing story isn't helped by the animation, which is ugly to look at and not especially well designed. Similarly, the cast are nigh on indistinguishable, with the result that there's not a single likeable character in the film, so it's difficult to care when they start getting killed off. In a word, no. Free Jimmy is a thoroughly dismal cartoon that should be avoided at all costs.